VietPress USA (Feb. 20, 2018):Today on Tuesday, Feb. 20, 2018, President Donald Trump tweeted that "I have been much tougher on Russia than Obama, just look at the facts. Total Fake News!". Who created Fake News here? The fact is that in December 2016, before leaving the White House, President Barack Obama accused Russia for meddling the U.S. 2016 presidential election and issued unprecedented sanctions against Russia for this interference in the 2016 presidential election, ordering 35 Russian diplomats to leave the U.S., and the closure of two Russian compounds. Where are the evidences or explanation for Trump's tweet to claim that he has been much tougher on Russia than Obama? Trump repeatedly rejected the assertions by U.S. intelligence agencies that Russia was behind the hacking. And the president has still has not put into effect new sanctions — passed by large majorities in Congress last year — that were designed to punish the Kremlin and deter it from interfering in the 2018 midterms. And in October, the Trump administration missed a deadline to publish a list of Russian entities and individuals in the military and intelligence sectors subject to sanctions. President Trump declared on Tuesday, without evidence or explanation, that he has been “much tougher on Russia” than President Obama. I have been much tougher on Russia than Obama, just look at the facts. Total Fake News! It’s not clear which facts Trump is referring to. In December 2016, Obama issued unprecedented sanctions against Russia for Moscow’s interference in the 2016 presidential election, ordering 35 Russian diplomats to leave the U.S., and the closure of two Russian compounds. 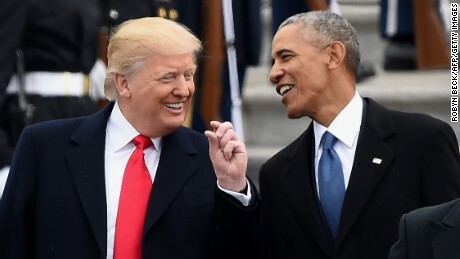 Earlier Tuesday, Trump pointed to comments his predecessor made less than a month before the 2016 election: “There is no serious person out there who would suggest somehow that you could even rig America’s elections,” Obama said in October 2017, responding to Trump’s repeated claims that the vote would be “rigged” in favor of the Democratic nominee, Hillary Clinton. Trump tweeted the quote, which was featured on a “Fox and Friends” segment, and followed it up with some Trumpian punditry. But those are two different things. Obama was disputing that election officials would tamper with the vote totals to favor Hillary Clinton — something that has not been shown, or even seriously alleged, to have occurred. The issue now is Russian meddling in last year’s election by way of social media and hacking, which the heads of all the major security agencies agree happened last year — and is continuing into the 2018 election cycle. On Friday, special counsel Robert Mueller’s office announced charges against 13 Russians and three Russian entities for allegedly carrying out an elaborate plot to interfere in the 2016 election. On Monday, after a weekend filled with tweets about the Mueller indictments, Trump falsely suggested Obama didn’t “do something” about Russian meddling. Have a great, but very reflective, President’s Day! On Oct. 7, 2016, the Obama administration announced its belief that the Russian government was behind the hacking of the Democratic National Committee earlier that year. After the election, Obama ordered a review of the election hacking, which was followed by sanctions against Moscow. But some Democrats, including Rep. Adam Schiff, D-Calif., have criticized Obama for not doing enough. At a campaign rally in Columbus, Ohio, on Aug. 1, Donald Trump told the crowd that he feared November's election might end up being "rigged."